In its weight and color, the book has the beauty of something perfectly constructed for its task, like the natural thing. 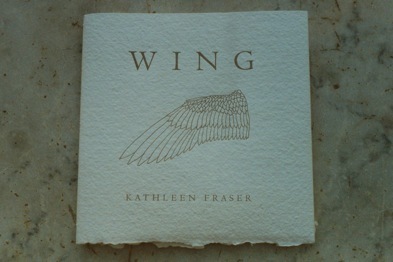 Kathleen Fraser’s poem is an experimental investigation of wing and cube. Like the artist/scientist Leonardo, whose Divina proportione human limbs stretch to compass a square, Fraser draws a visible cosmology. But to Fraser’s analytic eye its borders are violently erupted, as if each dream or occasion of pain had tried to lift itself/entirely away, contributing to other corners, plans and/ accumulated depth. Fraser’s accumulation of hurtling and fragmented models lifts off at the final poem, whose shape is a wing. 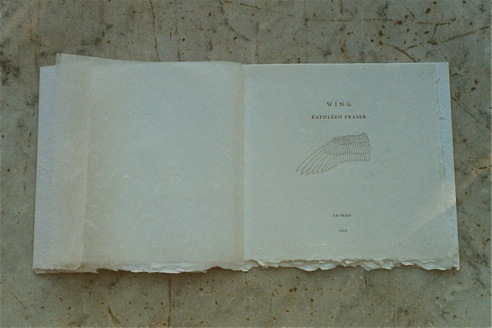 In Dale Going’s design, the white deckle-edged papers, square shape with its wing-like fold, and anatomical illustrations by David Marshall are feather-light attachments to Fraser’s text. The power and the beauty of this poem, the marvel of its unfailing invention, is the way it hovers, nimbus-like, around a never quite determined set of meanings involving the New, mediation, intervention, making, and the possible supernal, without its fragile weight ever collapsing beneath the burden of the poem’s debt to gravity. It is an immensely tactile poem, one intimately drawn up by and into the haptic, even while its descriptive energies stage its own visual ramps (Mel Bochner’s drawings, Jess’s paste-ups) with great daring and wit. The line in these poems is broken and recombined, fractured and wound back on itself, scattered pieces of mirror containing the image of the whole. Such procedures are what the violence of the New demands of us….We live inside the erasure, says the wing, of our passage from one place or moment to the next. Inside the tension of repletion and recession. And this is how things get built. The volumes and planes, the spaces for living are erased and lifted, but above all, re-iterated in a continual motion that’s both jagged and fluid. This is how the restless energies of the poem construct the door between inside and outside, which is the interstitial space of our real dwelling. The space kept alive through the ongoing reinvention of language. The space of the New, which is the place where we may also hold our dead….This is a poetry that plays along the strands connecting the numinous and the earthly, restoring the fractals of erosion and re-formation into a vibrant expression of the human. The final motion of the poem in the Third Black Quartet presents a different set of conditions for the idea of completion. The poem does not so much end, as continue over the horizon. The wing impresses the shape of its ghostly presence like a negative print of itself across the skein of words that have built it. It is a white blink. Blank. Absent. Or rather, locatable only in the space between the words. The after-image of its passage — the “vanishing point” where word meets wing and wing is nothing but a furling of the poem. “Wing” is all stutter and shimmer, heartbeat and “frayed, layered, fettered, furling.” Announcement of the possible. Where history is the re-write of history inside the silent interval that contests the very notion of limit. The wing is bright enough to burn us all. I want to consider specifically how Fraser's postmodernist work extends H.D. 's modernist poetics, by turning to…WING. As Fraser details in a recent interview, the series emerged from "seemingly disconnected levels" of social and historical context (several of which remind us of H.D. 's traumatic residence in London during the Blitz): the illness and death of a close friend from AIDS; two exhibits by artist Mel Bochner in Rome (one at the Museo Storico della Liberazione) that caused Fraser to ruminate about Italian Fascist and Nazi imprisonment of Jews, Gypsies, and resistance fighters during World War II; the archeo/logical remnants of imperial Roman history evident in the architectural layers of Roman walls (becoming Fraser's palimpsestic arche/text); and (perhaps the most unconscious coincidence of Fraser with H.D. 's Trilogy) Fraser's fascination from childhood with the spiritual iconography of angels and wings. Produced with visionary intensity during the London Blitz, Trilogy poignantly enspirits WING, I would like to suggest – with its "haunting" by the history of Rome and World War II, by angels, by death, and not least, by its invitation to inscribe "the blank pages/ of the unwritten volume of the new.…"In Fraser's "New," the palimpsestic fragments of thought, observation, "nested" quotations, phrases, sentences, words separate from each other, coincide, sometimes combine. The four verbal cubes of Part II, "First Black Quartet: Via Tasso," for example, depict what Fraser describes as "the breaking up of matter and its reformation….”The four spatially-related cubes of Part II illustrate a number of Fraser's formal innovations which echo H.D. (with all of the aspects of distortion that accompany the phenomenon of echo). In Fraser's serious wordplay, "the New is used." Patterns of thinking, the mindset of line and power which H.D. 's Trilogy contemplates urgently as well, are shattered and reassembled….Formal improvisation and visual/aural association ("picking, pecking") expand upon the semantic possibilities explored in H.D. 's aurally excessive, but visually "contained" poetics. H.D. 's revisionary "Tribute to the Angels" becomes, in Fraser's postmodern layering of loss, much less certain or reassuring: "ghost or angel" come to tell us what "we didn't want to know"; a body-of-words (also a body-in-pieces) intersecting spatially so as to interact visually and semantically….Finally, the poem opens to what Fraser herself has discussed as "covert error leading to unimpeded risk" and unfettered insight. Through an "accident" produced by the formal experimentation that she was conducting, Section X, "Vanishing Point: Third Black Quartet," concretely materializes WING….Fraser describes the process of writing this last section as the unplanned, formal contextualization of an "out-of-context" experience. An experiment with mechanical/formal repetition leads to a visual discovery (the shape of a wing) and an insight that "being taken outside of my normal frames of reference" catalyzes…. In winging it, WING opens its wings to the poetically possible…. Fraser has always been a poet whose lyric transcendence and devotion to beauty (such as the painting of Giotto) have obscured for some readers her formal radicalism. Yet precisely what Fraser finds in Giotto's details is his "break from the artistic conventions of his time." Make no mistake – Fraser's poetry provides an entry into a radical arena in which meaning is contingent, uncertain, in which our cherished preconceptions are unhinged. corner turned now in partial erasure . . .
As if memory were an expensive creamy paper, Kathleen Fraser responds to the drawings of Mel Bochner in WING, a ten part poem series designed and letterpress printed by Dale Going of Em Press. The mathematics of an angle the material body of a cube counterpoised with the wing not static but frayed, layered, fettered, furling, and stoney are the materials of Fraser’s investigations. On crisp white, richly textured St. Armand cover and text papers, the reader meets the nature of a wing with each turn of the furled rag page. Moving through accumulated depth, the poems respond formally to the spatial properties of wing and cubed matter in this beautiful volume. The form of “II. First Black Quartet: Via Tasso” is a four part cube of compressed text that weights the left page. It faces III. Wing: Via Van Vitelli” that resembles a wing from the right rag margin to the open spaces within the text as a bird’s hollow bones enable it to leave the ground. By the second black quartet, the cubes gain solid movement – a windmill’s four sails arc air – to meet the single line of the facing page’s horizon: There are two men without feet, they are tall men swimming through matter. The presence of two unnamed men (Joe Brainard and Kenward Elmslie) several times re-enter bodily but as if in partial erase. In the final sequence, cube and wing oen to eah other: figured in the cube is a wing draw[ing] the mind as a bow as language exerts itself to be volume by necessity as if partial erase. Fraser’s meditations sited in visual art – always beautiful to the ear and eye – are deeply evoked in this Em Press edition. Going’s design, stately and understted, complimented by Daavid Marshall’s simply wrought drawing and diagram, is interpreted in translucent end papers, a measured nine inch square page and the cover’s deckle flaps (of wing). The language and presentation are strong and extraordinarily pleasing. WING was suggested by Mel Bochner’s Drawings (David Nolan Gallery, NYC, 1988) and by Bochner’s 1993 installation Via Tasso at the Museo Storico della Liberazione di Roma; Jess’s “paste-up” (cover for Norma Cole’s Mars) delivered my point of focus for entering and retrieving certain materials of the poem. WING is dedicated to the memory of Joe Brainard, who died of AIDS during its writing, and to his companion, the poet and librettist Kenward Elmslie, who has kept the spirit of reinvented language alive. - Kathleen Fraser, “Notes on Poems,” p. 196, il cuore: the heart, Selected Poems 1970-1995, Wesleyan University Press, 1997. Designed and letterpress printed by Dale Going at Em Press on a Vandercook SP15 from photopolymer plates of Monotype Centaur digitial type. The handmade text and cover papers are from St. Armand in Montreal, with Echizen Unryu end papers from Japan. The illustrations are from drawings by David Marshall. Exhibited in The Rounce & Coffin Club Western Book Exhibit, Book Club of California, San Francisco, April 1996; Bay Sampler: A Book Arts Celebration Honoring the Opening of San Francisco’s New Main Library, April 18-June 9, 1996; Science Imagined: An Exhibition of the Book As Art, Berkeley Art Center, October 27-December 9, 1996; Livres de poètes (femmes) , Berkeley Art Center, June 2000. A broadside of one of the poems was printed to celebrate WING’s publication in il cuore: the heart, Selected Poems 1970-1995. Kathleen Fraser's seventeen books of poems include W I T N E S S, a letterpress sequence with linoleum prints by Nancy Tokar Miller (Chax); Discrete Categories Forced into Coupling (Apogee Press), and il cuore: the heart, Selected Poems 1970-1995 (Wesleyan University Press). Her collected essays, Translating the Unspeakable, Poetry and the Innovative Necessity are part of the Contemporary Poetics Series from University of Alabama Press. She has collaborated on two artist books — boundayr, with aquatints by Sam Francis, and from a text, with original paintings by Mary Ann Hayden. Fraser currently teaches in the graduate writing program at California College of the Arts/SF fand lives for five months of each year in Italy, reading and lecturing widely on American poetry and actively translating work by contemporary Italian poets. In 1973, Fraser founded The American Poetry Archives during her tenure as Director of The Poetry Center at San Francisco State University. Between 1983 and 1992, she published and edited HOW(ever), a journal for poets and scholars interested in modernist/innovative directions in writing by women – updated to the current electronic journal How2.